What you must also understand is that it is never a straight road to financial freedom, but a long twisting road with many potholes, road blocks and detours. It takes dedication, focus and commitment with constant learning and effort….but where to start? The very first step is being able to manage your money, with the basic principle of spending Less than you earn and investing the difference…a simple concept but easier said than done! With my stepping stones of wealth system, which is broken down into a simple 5 step process! Not a dreaded budget… but a system for managing your money that works, that is easy to use and doesn’t leave you overwhelmed! Have contingency reserves… Have buffers in cash or lines of credit that you can access quickly for either emergencies and opportunities… Remember the golden rule – cash flow is king! Remember Cash flow is king! There is share trading, domain trading and numerous other methods, but the method I highly recommend, and believe is the simplest for the average person, is for you to invest your time and energies into creating an online business. With the extra cash flow, the key then is to funnel the extra money back into growth assets such as property and blue chip shares or stocks, as well as back into your business, debt reduction and lifestyle! Here at My Road To Financial Freedom, my goal is to teach these concepts to as many people as possible, so they can manage their money in a way that will help them on their OWN road to financial freedom! 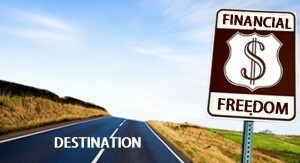 FAST TRACK YOUR ROAD TO FINANCIAL FREEDOM AND BUILD AN ONLINE BUSINESS – FREE TRAINING COURSE! Hi John, Great article. 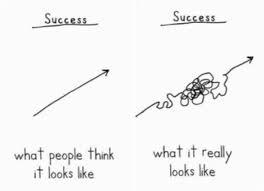 Really great pic / illustration of what success really looks like. Some people get dis-heartened but the setbacks and give up just before they succeed. Thanks Oak, yes they do, but it there is no point burying your head in the sand! What bs did I click on to come across this bs. I am glad you did manage to click on my site Josh and leave a comment, but just wondering why you consider it bs? The fact is that good money management is simple and common sense, but the problem is that the majority of the general public just don’t do it! I certainly hope that you have a money management system in place that is working for you and you are on your way to millionaire status? Love your catch phrase.. Dream It…Believe It…Then Achieve It! Your money management system is pretty comprehensive and you offer some really good advice. I’m a big believer of trying to really get rid of debt, and if you have to have debt, have it in the form of mortgage debt. At least in the states we can write off the interest of mortgage loans on our personal tax returns. But once that debt is gone (car loans, student loans, credit cards) it really frees one up to use money to their advantage. I also really like your recommendation of having cash on hand or a line of credit to take advantage of opportunities that come your way. Not everyone thinks about having a line of credit for this. Great post and very helpful information. You are right, debt really is a huge trap and must be eliminated as soon as possible! Hi Kingsley, I have made some enquiries and there are some countries that are not allowed to join the starter membership…. India, Nigeria, Philippines, Pakistan, Vietnam, Bangladesh and Egypt. Those countries can only take the premium membership for $47. This is due to high levels of Fraud in these countries. Unfortunately you will be unable to claim the free starter membership, however you can join up for the premium membership. If you are determined to make a living online, you will still find tremendous value in the premium membership and I am sure you won’t be disappointed! You can join premium here ==>> Wealthy Affiliate Premium. Thanks for the valuable lesson. I got quite some take from your lessons. I am one who always struggle with cash flow issues that further plug me into more debt when i ‘m hit with more bank charges for NSF. I will implement some of the strategies you recommend. I also subscribed to your newsletter as I want to learn more and not miss on any updates. Awesome Tich! I appreciate the support!! Cash flow and money management is a big issue for a lot of people and it is a real passion of mine to help as many people as I can to take control in this area of their lives. Let me know if I can help you further in anyway at all! Thanks for these money tips, John. I like that you have taken all the pressure out of doing a ‘budget’ and instead empowering people to create a ‘money management system’. My daughter won’t cringe any more when I stop using the ‘b’ word. Thanks for your comment Janelle! Teaching our kids about money is certainly no easy task, but if they learn and follow these principles early in life the world is their oyster! Thanks so much for your support Martina! Money may not be the most important thing in life but like oxygen you can’t do much with out it! So we may as well master our money and live life on our own terms! Love the way you present the facts, great information and very easy to understand and follow! That is why I love the concept of starting online business’s. As you say, on your own terms!! !